In medium bowl, mix flour, cinnamon, ginger, cloves, salt and nutmeg; set aside. In large bowl, beat butter and brown sugar with electric mixer on medium speed until creamy. Beat in vanilla and eggs until fluffy. On low speed, beat in flour mixture. Divide dough in half; flatten each half into 1/4-inch-thick round. Wrap dough rounds separately; refrigerate about 1 hour or until chilled. Heat oven to 350°F. On floured cloth-covered work surface, roll half of dough at a time with floured rolling pin to 1/8-inch thickness. 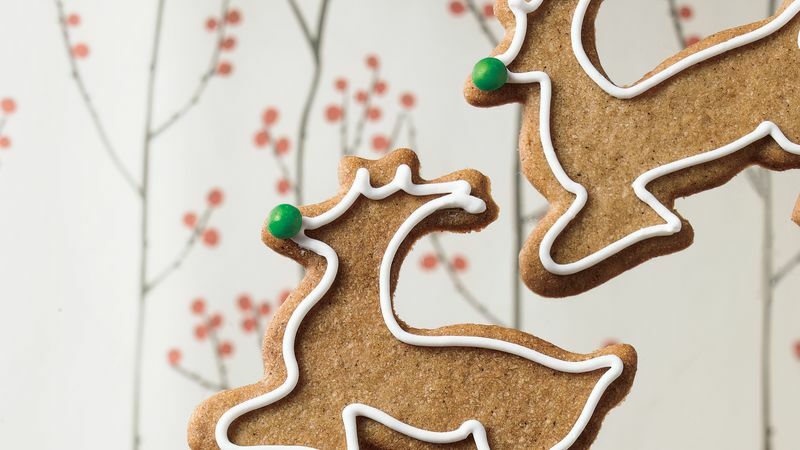 Cut with floured 2- to 3-inch reindeer-shaped cookie cutter; place 1 inch apart on ungreased cookie sheets. Bake 9 to 11 minutes or until edges are light golden brown. Cool 1 minute; remove from cookie sheets to cooling racks. Cool completely, about 30 minutes. Place frosting in large resealable food-storage plastic bags. Seal bag; cut off tiny corner of bag. Squeeze bag to pipe frosting along edge of each reindeer cookie. Place 1 cinnamon candy on each for nose. Undecorated cookies can be easily wrapped, labeled and frozen up to 6 months. Decorate just before serving. To make decorating these cookies easier, pipe frosting on each cookie, then add a cinnamon-candy "nose."